The original Amazon Echo was an ugly black tube—a speaker meant to be set back in the corner, hidden from view. It was a cheap imitation of the computer from Star Trek. The new Amazon Echo is a much prettier device. It’s not suddenly faster or smarter, and your old Echo will do the exact same thing as before, but this one actually looks pretty nice, sells for cheaper, and boy does that make a difference. Amazon’s focus with the variety of Echo devices has always been on how well it works and how cheap it can be. Attractiveness feels like a distant consideration for Amazon products. The $50 Dot and the silly $130 Tap were built with that same philosophy. Making good-looking devices mattered less than making devices that just worked. At least that was the idea. Unfortunately, the Tap, a portable Bluetooth speaker, required you to physically press a button to access Alexa, defeating the whole always-listening concept that made the Echo cool in the first place. An update to the original smart speaker. You can customize the appearance! It's still not an exceptional speaker. The Dot, which was like someone cut off the top of an Echo and sold it for a fraction of the price, has been much more critically accepted. Sure the sound isn’t great, but the thing is cheap and it works. It’s so inexpensive and efficient, it feels more like Amazon’s idea of the Echo than the Echo itself. It even has an audio port, so you can connect another speaker if you want. (The new Echo wisely copied this feature.) In fact, when asked by friends, most people here at the Gizmodo office recommend the Dot to prospective purchasers long before we suggest the Echo. The Dot is no stunner by any means, but it’s cheap and it works. It’s a a great deal for the money! And until late last year that utilitarian approach really worked for Amazon. Good for the money—good enough. For years it was the only company making smart speakers. It didn’t matter what it looked like. As long as it could answer your questions and play your music, all was good. A simple, ugly, speaker that answers your Amazon-related questions isn’t enough anymore, as other digital assistants have glutted the market Amazon created. Harman Kardon just introduced the Invoke, a Cortana-powered speaker that looks a lot like a first generation Echo, and Apple is expected to launch the Siri-powered HomePod in December. The new Echo next to last year’s Home. But it was the Google Home that seems to have really forced Amazon to alter its approach to Echo design. The Home isn’t just way more attractive (with substantially better bass), it’s appearance is customizable too. Beside it, the original Echo is an eyesore. The Echo has always felt like it was intended to be hidden away, and here came this device meant to have a prime spot in the room. The new Echo is smaller and easier to leave out in the open thanks to an attractive outer shell that’s easy to replace. 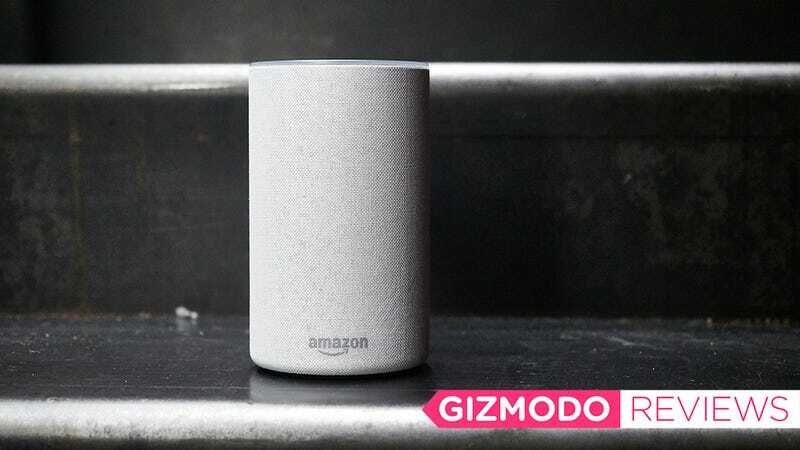 The audio isn’t much different on this new Echo, and you probably won’t notice the addition of more microphones to listen to your voice, unless you’ve struggled to get the old Echo to hear you over loud music. The only things to truly change are the design and the price. The Amazon Echo has come a long way from the tube introduced back in June of 2015. 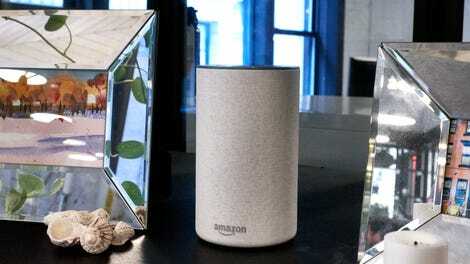 Amazon wants to make sure this speaker, or one of the myriad of variations mentioned above, is in your home, listening to your trials and offering help with a friendly chirp. If you don’t mind big corporate brother dishing out the news and your tunes, this latest speaker is a great choice. It turns out appearances do matter. It’s like the original Amazon Echo, but only $100. With additional microphones so it can hear you better over loud noises. And you can switch out the other shell so it better matches your decor.